Dave Stone shares creative ideas, real-life stories, and scriptural guidance about how to be a family that puts others first. In this third book from the Faithful Families series, How to Raise Selfless Kids in a Self-Centered World, Dave Stone continues to share his practical, conversational, and humorous approach to the challenges of building a strong spiritual foundation for the family. 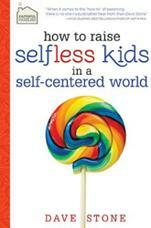 He equips parents with what they need to raise kids whose focus is not always on themselves. Some topics include: Becoming Others Focused, Service, Generosity, Forgiveness, and much more. Preaching is his gift, but Pastor Dave Stone’s family is his life’s blessing. And after raising three kids of his own, as well as shepherding the diverse families of his twenty-thousand-member congregation, his heart and passion for building strong families rings louder than ever. He knows that raising faithful families is a vital key to continued growth of the church.